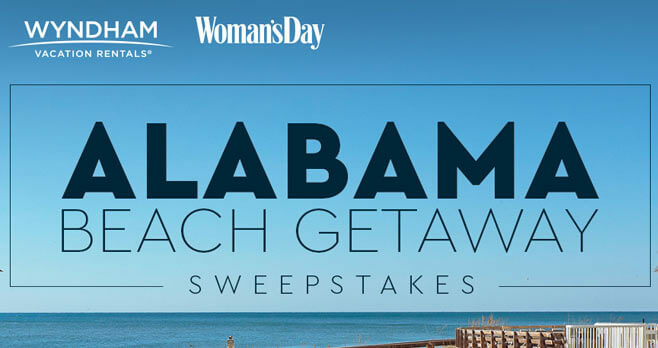 Enter the Woman’s Day Alabama Beach Getaway Sweepstakes by registering online at girlfriendsgetaway.womansday.com and you could win a girlfriends getaway for four to Alabama’s Gulf Coast. Eligibility: The Woman’s Day Alabama Beach Getaway Sweepstakes is open to legal residents of the 48 contiguous United States and the District of Columbia, who are 18 years or older at time of entry. Promotion Period: The Sweepstakes begins on August 7, 2018, at 12:01 AM (ET) and ends on September 17, 2018, at 11:59 PM (ET). Prize(s): The grand prize consists of a a 4-night stay for Winner and up to three guests at one of 2 Wyndham Vacation Rentals in Gulf Shores or Orange Beach, Alabama. What a trip for myself and three daughters-in-law!